Update: Samsung has denied all reports that it's planning to pull out of PC making, describing them as entirely "groundless". There'll be dancing in the streets at this news, no doubt. Just a week after unveiling its new Ativ One 5 Style all-in-one, Samsung has decided to depart the desktop PC business citing the changing computing market and the rapid decline in sales of traditional machines. In another nail in the coffin of the PC industry, Samsung said it was exiting to focus on profitable sectors like its smartphone, tablet and laptop business. The Korea Times brought word from a Samsung official, who said the time was right reallocate company resources to money-making ventures. 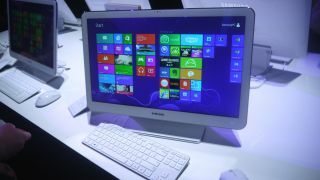 The official said: "Tablets, all-in-one and hybrid PCs are Samsung's current focus. Samsung is speeding up its restructuring of its PC business via product realignment toward profitable variants." Another unnamed company employee pointed out how the market for the conventional desktop PC is getting is shrinking at an alarming rate. The official added: "Demand for conventional desktop PCs is going down. We will allocate our resources to popular connected and portable devices." Despite only launching a desktop PC last week Samsung, has been cooking up alternatives for a while. The company's high-end Ativ Q hybrid laptop/tablet device, also launched last week, can switch between Windows 8 and Android Jelly Bean and is the first device of its kind to perform such a task.